« What’s Robert Bigelow up to now with NASA? Is Virgin Galactic ready for powered flight? 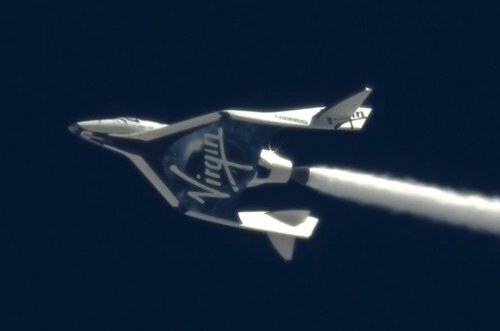 A successful glide flight Friday by SpaceShipTwo could be the final step before Virgin Galactic attempts what it calls “the most significant milestone” yet for the suborbital vehicle: powered flight. SpaceShipTwo (SS2) performed a 10.8-minute glide flight April 12 in the skies above the Mojave Air and Space Port in California, the second such flight in as many weeks. This flight was distinguished by a “cold flow” test of the SS2’s propulsion system, where nitrous oxide flowed through the rocket engine and out the nozzle, creating a distinctive contrail. “As well as providing further qualifying evidence that the rocket system is flight ready, the test also provided a stunning spectacle due to the oxidizer contrail and for the first time gave a taste of what SpaceShipTwo will look like as it powers to space,” Virgin Galactic noted in a statement. When might this powered flight take place? Parabolic Arc reported earlier this month that April 22 is rumored to be the likely date for the first powered flight. That date has also come up in conversations during the Space Access ’13 conference this week in Phoenix. 5 comments to Is Virgin Galactic ready for powered flight?